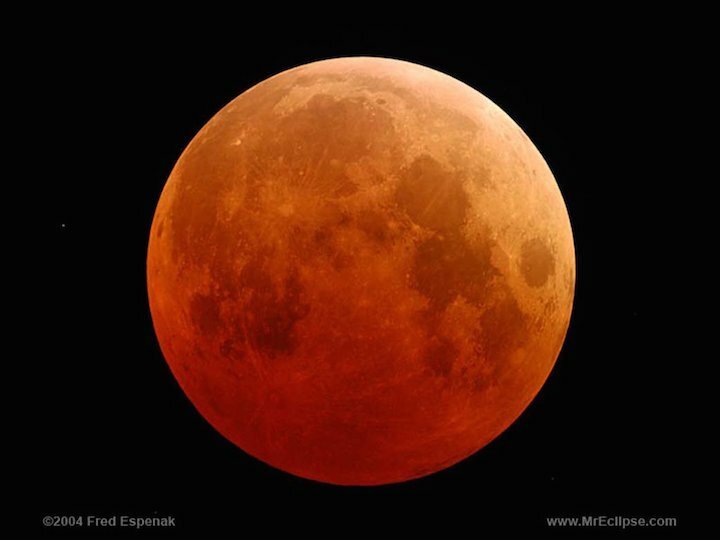 The moon turns blood-red in this image of a total lunar eclipse from 2004. A total eclipse of a "blue moon" will occur on Jan. 31, 2018. The first eclipse of 2018 will be a lunar one that comes at the very end of the month, on Jan. 31. It will be a total eclipse that involves the second full moon of the month, popularly referred to as a Blue Moon. Such a skywatching event hasn't happened for more than 150 years. The eclipse will take place during the middle of the night, and the Pacific Ocean will be turned toward the moon at the time. Central and eastern Asia, Indonesia, New Zealand and most of Australia will get a fine view of this moon show in the evening sky. Heading farther west into western Asia, the Indian subcontinent, the Middle East and Eastern Europe, the eclipse will already be underway as the moon rises. To the east, Alaska, Hawaii and northwestern Canada will see the eclipse from start to finish. Moonset will intervene for the rest of North and Central America, however. 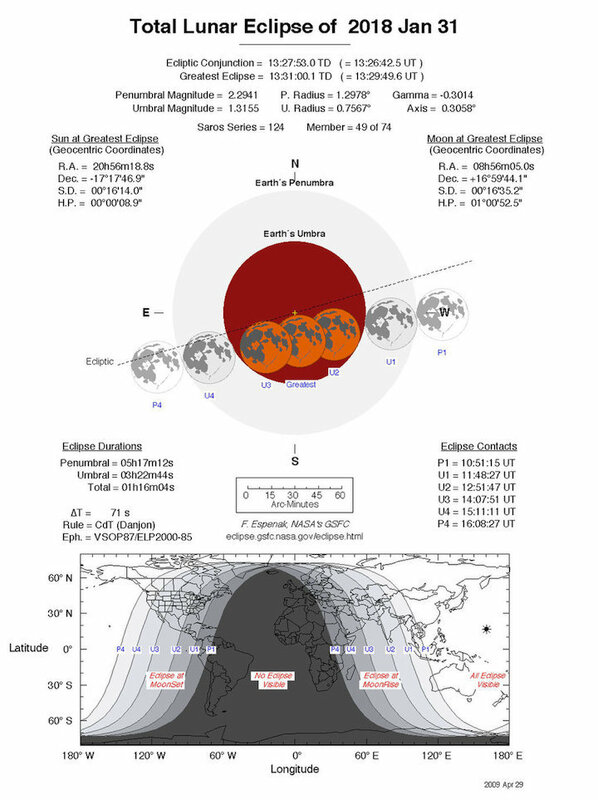 Below, we provide a timetable for the main stages of the moon's passage through the Earth's shadow for six time zones — one for Hawaii (HST), one for Alaska (AKST) and four across the U.S and Canada: Pacific (PST), Mountain (MST), Central (CST) and Eastern (EST). All times are a.m. Timetable for the main stages of the Jan. 31, 2018, blue moon total lunar eclipse, for six time zones. Along the U.S. West Coast, the total phase begins at 4:51 a.m. PST. The farther east you go, the closer the start of the partial phases will coincide with moonrise. Along the U.S. Atlantic Seaboard, for instance, the moon will have only just begun to enter the darkest part of Earth's shadow, the umbra, at 6:48 a.m. EST when it will disappear from view below the west-northwest horizon. The duration of the total phase is 77 minutes, with the moon tracking through the southern part of the Earth's shadow. So, during totality, the moon's lower limb will appear much brighter than the dark upper limb. How unusual are Blue Moon eclipses? To answer that question, we consulted the reference book Canon of Lunar Eclipses, 1500 B.C. - A.D. 3000, by Bao-Lin Liu and Alan D. Fiala (Willmann-Bell Inc., 1992). This NASA chart by eclipse expert Fred Espenak details the visibility range and times for the Jan. 31, 218 total lunar eclipse, which also occurs during a blue moon and near a supermoon. After this year, the next time that a Blue Moon passes through Earth's umbra will be on Dec. 31, 2028, and, after that, on Jan. 31, 2037. Both of these eclipses will be total. Before 2017, there was an 8 percent partial eclipse on Dec. 31, 2009, but, for a total eclipse of a Blue Moon, we have to go all the way back to March 31, 1866. So, the upcoming eclipse on Jan. 31 will be the first total eclipse of a Blue Moon in nearly 152 years! We will have more to say about January's eclipse here at Space.com in the coming weeks.